Thanks to Jen and Kellee at Teach Mentor Texts for this weekly roundup of reading. My library and bookstore appreciate the numerous additions to my TBR list over the past year. So, it's the first Monday of a brand new year. 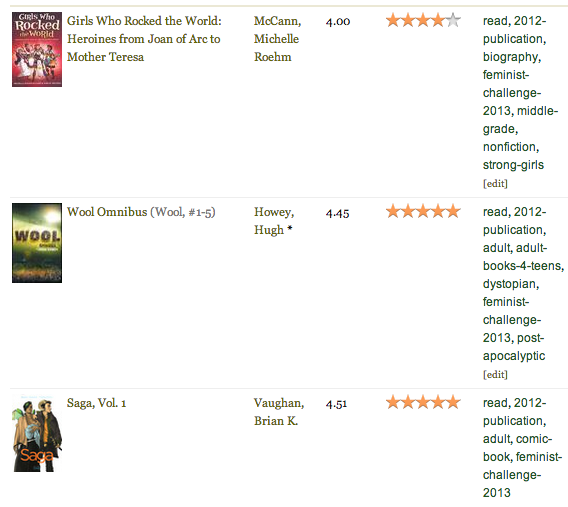 I didn't get as many books read this week as I did last week (that's what happens when work interrupts my reading time! ), but I sure read some great ones! 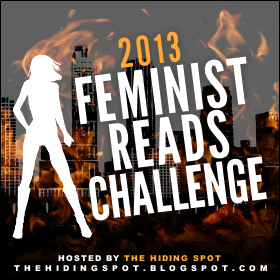 Let's start with my "Feminist Reads Challenge" (Created by The Hiding Spot) books. It seems a bit disingenuous to have signed up for this as an official challenge, since my reading life tends toward this type of book anyway - but I can live with that. I've already read 3 books that I feel fit with the nature of the challenge. Girls Who Rocked The World - is a nonfiction that shares the lives of women who changed the shape of the world. The only catch is that the author only selected women who started to make this difference while they were still under 20. I'll be sharing more about this book tomorrow. Saga - is a comic that is definitely for mature readers (it is labeled M for mature, and has some graphic content). It's a story of war, and a story of love. Two races are at war, and their conflict has divided the known world. Yet a man and a woman on opposite sides of the battle lines have fallen in love. The story is told with a twist - the narrator is voice of their daughter. This volume compiles the first 6 issues of the comic. I'm making an effort to read more picture books along the way, and this week I read a Nerdy Short List book. I loved the illustrations, and the message (though I do think it was a bit heavy handed). This makes 58, and I'm excited to be almost finished the 50s! I noticed, once again, the deeply entrenched gender roles in this one. Most of the story was fun, though I thought that it was about 75 pages too long. I thought we'd gotten to the end of the tale, and then a new part started up. I also may put off other books for a while, as the FINAL book in a series I've been reading since high school releases this week. Anyone else been reading The Wheel of Time series for 20 years?